Meet Eric a French itinerant tree climber and tree cutter. 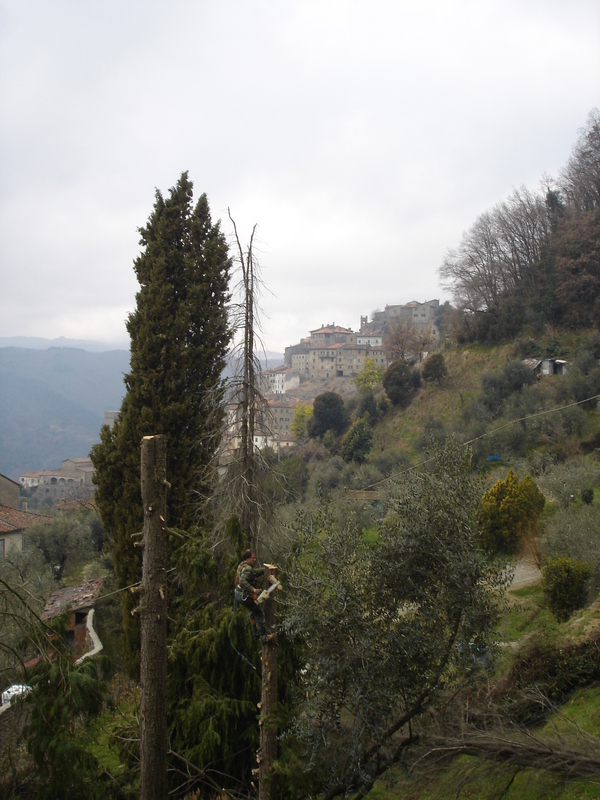 In the mid 1960’s a Florentine family bought Casa Verde and replanted and restocked the terraced land. The planting included four pine trees among other such trees that formed the amphitheatre at this end of Vellano. Sadly, partly through neglect of the land, partly through drought and age these trees have died and have become unsafe so they needed to be felled. The question was how to do it? Eric, in the space of three hours cut down these four trees by climbing the trunks with a rope and crampons, cutting away the lower branches on his way up then cutting the large trunks from the top down. This was achieved with an amazing degree of skill, speed and efficency. Now our view from the house is even better! We plan in the next few years to plant more olive and fruit trees. To restore the ‘campi’ to their original full and plentiful state. 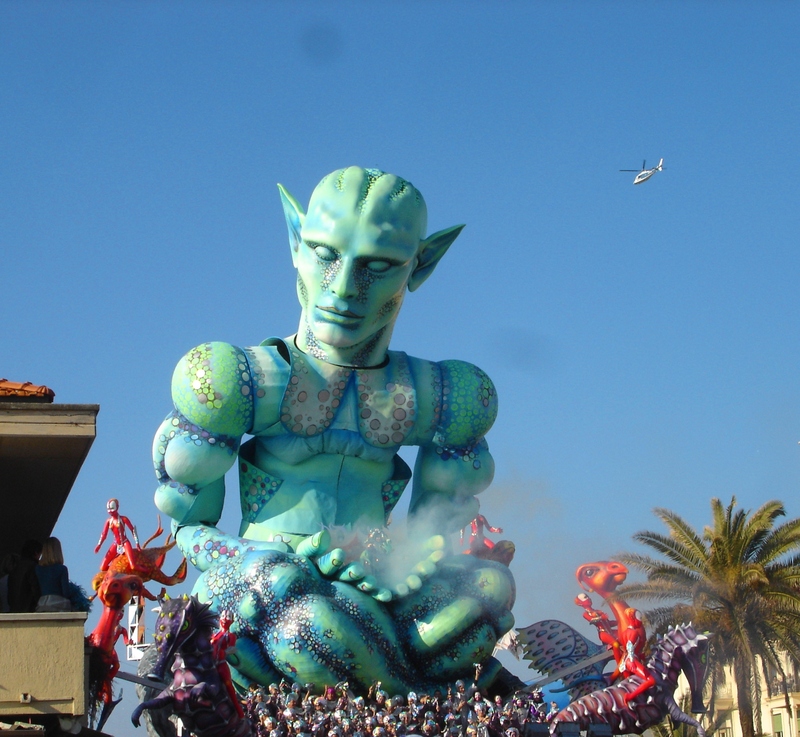 Another photograph from Viareggio Carnevale, now ended for another year. La Bestia comments on the predominence of technology in our everyday lives. Here in the hills everyone is getting out their tools for cultivation. Their rotivators, spades, diggers, hoes and other such things. Trenches are being double-dug, olives trees and other fruit trees are being pruned and fires are being lit to dispose of the remnants. There is something much more earthy and traditional about these activities. Not that Italians are without technology, the range of clever machines and tools to make land management easier are multi-various and amazing. 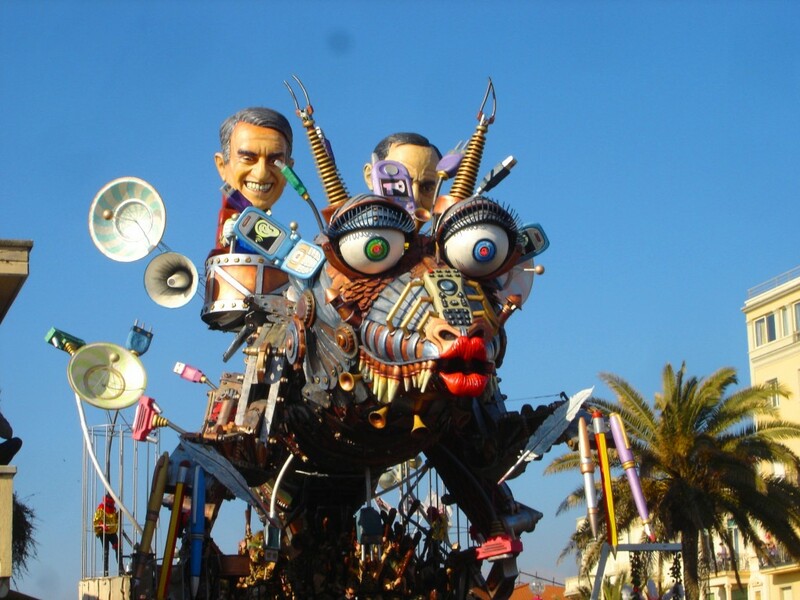 It is coming to the end of carnevale time in Italy and in Viareggio for 5 days over 4 weeks there is one of Europe’s best parade and float carnivals. Always held of course around lent. Thousands of people flocked there on Sunday March 6th this year in gloriously warm sunny weather to see this most colourful of events. We travelled the short journey from Pescia to Viareggio on the train which was packed with many people. Many of them dressed up wonderfully for the occassion. We saw many Supermen (and women); lots of glitter and ABBA costumes, and many dressed as furry animals. Most of the children were dressed as fairy tale characters or cartoon figures. Many carried bags of glitter and confetti to create a blaze of colour and light.